Christmas food is by far the best kind of seasonal food as it pretty much covers off all delicious bases, and every year there seems to be a new twist on a festive favourite. Pieminister has absolutely excelled itself on the Christmas front. Their festive menu is on budget, with their fanciest food offering coming in at a mere £18 for a solid 10/10 food coma status, with a £15 option if you're heading there at lunchtime. It should be considered that even the lunch version will reduce any afternoon productivity as it's still a whole load of delicious food. Pieminister invited me and my gals Haydy and Hayley in to review their Christmas Feast, and whilst the meal was complimentary, this review is by a longtime fan of Pieminister. 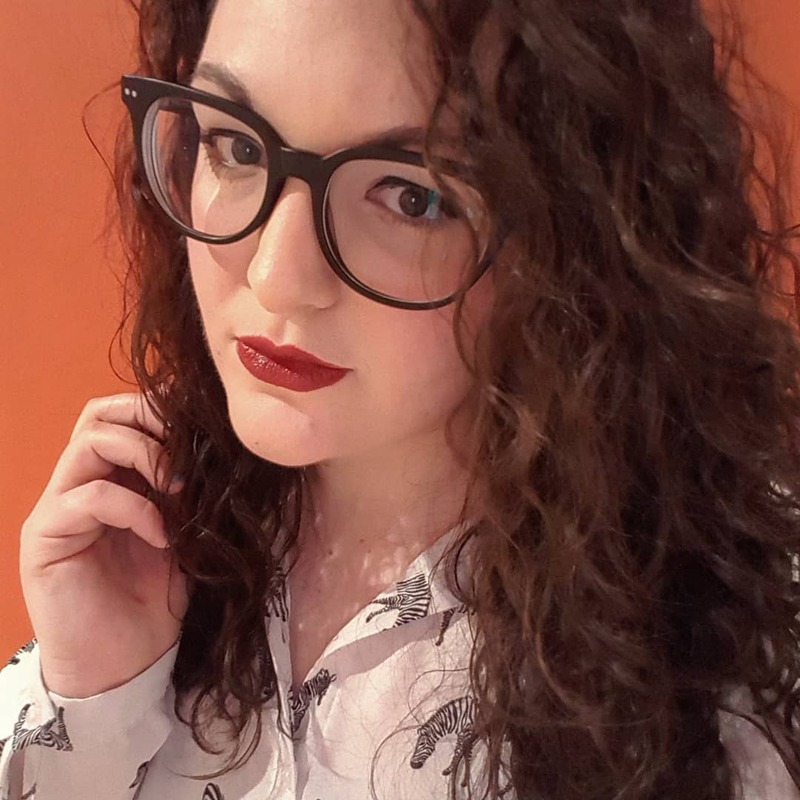 We headed to their Leeds restaurant on a Friday night to try it out and needless to say, we were all pretty impressed. The Christmas Feast (£18 option) consists of a starter, pie, two sizes, a stick and a pudding, whereas the lunch menu is a two course option, so everything but a starter, and both have the option of adding a glass of fizz for £3. 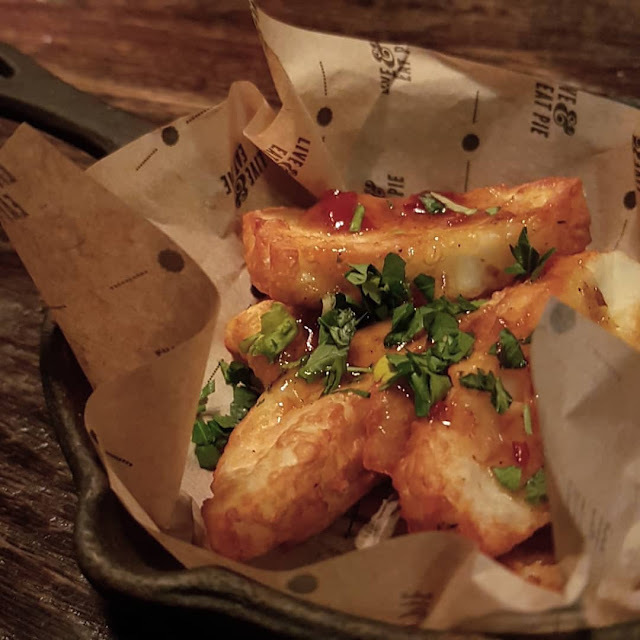 From the starters, we all went for halloumi chips as is it even Christmas without some deep fried cheese? They were coated in sweet chilli and lemon and were all kinds of delicious, though I must admit, the honey and mustard pigs in blankets definitely tempted me. Halloumi has been my favourite food of 2018 (yes, it's taken me until age 26 to try it, please don't judge) and Pieminister's didn't disappoint. The pie is topped with a 'stick' which has a few things speared on it and naturally I went for the meaty stick which was a pig in blanket, stuffing, mini Yorkshire pudding and cranberry sauce. I love that these are a nod to the Christmas dinner but doesn't take away from the fact that you're eating a pie not a roast. There are a load of festive pies to choose from (including a vegan option), but I went for The Cracker - turkey, cranberries, parsnips and sherry. The meat was tender, there was a great filling to pastry ratio and it was full of flavour. I picked mash and smoky baked beans as my sides, both of which were delicious but I only managed a few mouthfuls of the beans as I was that full, yet determined to have dessert. The mash is really creamy and delicious - I'd recommend it to anyone, whether you're in Pieminister for the Christmas menu or not. When it came to dessert, despite us all being full to bursting, we couldn't resist. I had the Mince Pie Icecream Sundae which people will either love or hate depending on whether you like mincemeat. This was vanilla icecream, sprinkled with cinammon, mincemeat and served in a wafer pot with shortcrust pastry stars. It's the lightest dessert on the Christmas menu yet still felt fairly indulgent and tasted seriously festive. I really enjoyed it, even though I was expecting the ice cream to be mince pie flavoured. Overall, I'm definitely impressed by the menu but if I was to go back for this particular menu, I'd probably go for one side not two as it was just a bit much for me. 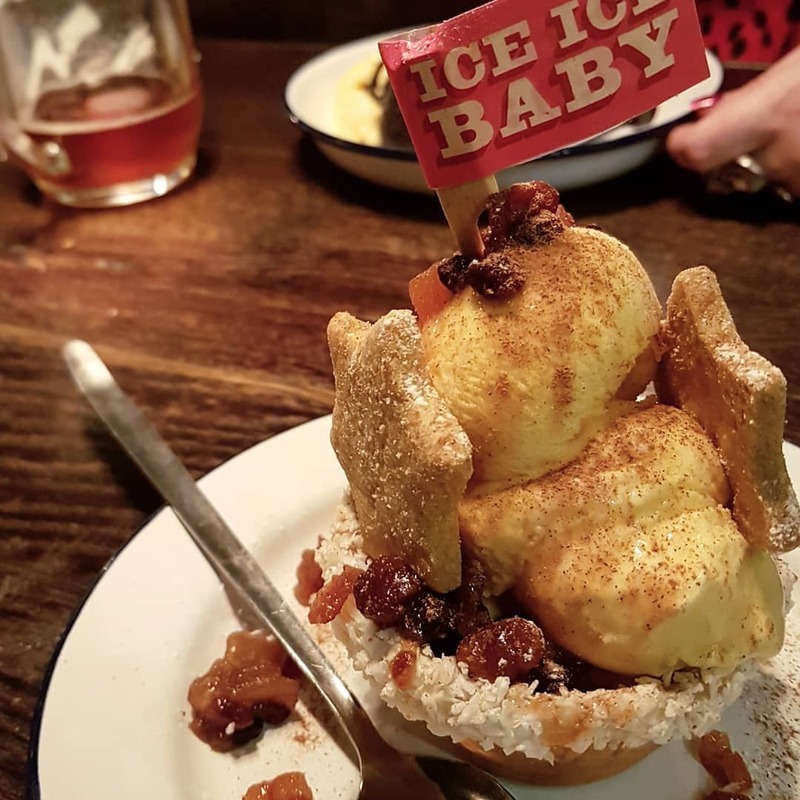 I'd recommend going to indulge in the festive menu at Pieminister and heading there absolutely ravenous as it's a hefty meal which is perfect if you fancy treating yourself. 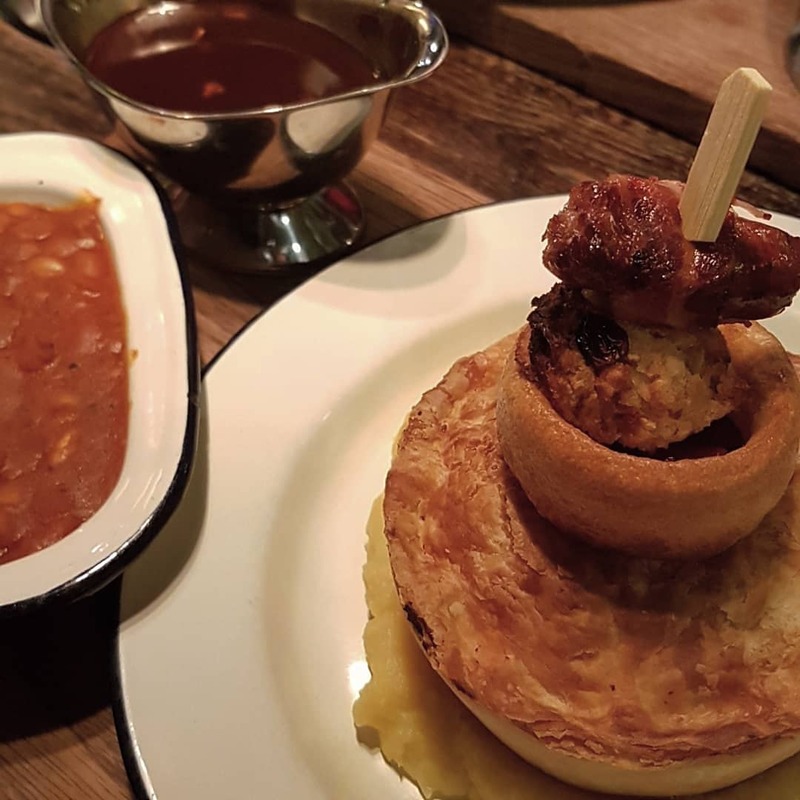 Have you been to Pieminister before? Let me know in the comments!